I thought I was going to write something yesterday… but didn’t. Truth is, there isn’t a lot to analyze here. Deadpool keeps going. The newcomers simply failed to find an audience. Eddie The Eagle is a charmer, but it just never turned the corner, perhaps because its lead is unrecognizable to Americans, perhaps the title (the story is ancient in internet time), perhaps they should have gone to SXSW (or Sundance, if they didn’t try that). Oscar movies are already gone, pretty much. The only indie killing it is The Mermaid, which is still under house arrest. I have pushed back against The Exclusionary Rule from its first announcement. My last column on it pretty much had the effect I had hoped for, so I retired the fight. Now, thanks to the New York Times, the official writing on the wall has arrived for what may well lead to a complete elimination of The Exclusionary Rule. In weeks past, The Academy has told members seeking information that there would be no action until March, that the system was being restructured to be based on the judgment of each branch’s Governor, and that there was a dissension from high level members about this element of the announced changes moving forward. To be honest, there is backlash to the expansion of The Academy based on a search plan at the discretion of the President and CEO only, in order to bring in new members of color and women who might not have otherwise been considered. But no one will say that out loud. This is unfortunate, a combination of the nature of some members and the anger created by the sense that a nasty accusation is being hurled at older members, especially white males. I believe that the expansive part of the plan is completely appropriate… and will not be easy to accomplish, given the industry composition. I do not think that every actor or director, etc., of color or who is female should be brought in based on diversity after their first film that grosses over $10 million. There are many accomplished people who are reasonable choices for The Academy. And, if the effort runs into trouble with numbers, I believe it would be a service to the industry for The Academy to be open about this and to make it part of a public discussion. I will stick my neck out here and say that this means, to me, that the newcomer cast of Straight Outta Compton doesn’t belong in The Academy for their first or second recognized roles. This doesn’t mean that these young actors won’t be appropriate invitees within a year or two. But being of color and being part of an excellent movie that wasn’t nominated should not be the standard for entrance. That said, I would be happy to see veteran filmmakers (some already members, some black, some white) like F. Gary Gray, Andrea Berloff, Jonathan Herman, Billy Fox, Michael Tronick, Ice Cube, Will Packer, Shane Valentino, Kelli Jones, and others invited this summer. Dr. Dre… he is in that iffy category. A deity in the music world. Not a movie guy. He’s done a little acting, but this is his first feature as a producer. Cool, important man who happens to be of color. But a few more movie credits would seem appropriate. Also, I believe that in an inclusive Academy, every nominee should be invited into the membership. The idea that some are being brought aboard with less clear credentials because of gender or race, while a nominee doesn’t get an invitation is just plain wrong. If you’re opening the doors, open them to all of those vetted by the membership. I am not a fan of the way The Academy laid out the Exclusionary Rule, but I respect those who feel that there is a layer of membership that is really out of the business and should not vote. I think the number is much smaller than they seem to believe. But any effort to exclude current members should focus on members who are truly out of the game, not just getting older and less attractive to an industry that is already as age-biased as it is biased against color and gender. First, The Academy should publicly acknowledge that it was too hasty in the actions taken and that it will re-set and make certain that the rule is aimed at members who truly have moved on from the industry for a significant period. There should be an apology for the conflating of the idea of cutting back on some voting members and the wholly separate issue of the effort to be more inclusive of race and gender. But I don’t think they want to do that… at least not in public. My #1 standard for eliminating members’ voting rights would be that they have not been using their voting rights… but this is supposed to be a secret ballot and The Academy is not supposed to keep track of who votes. That secrecy, of course, becomes less likely as The Academy continues to move towards a 100% online vote. But if there was a way to know who hasn’t voted for, say, the last three years, those members would be at the top of my list for a change of status. A good place to begin would be a list of members who have not have a credit in film or television in the last decade. Adding television to the relevant credit list is not only in keeping with the industry as it is today, but also speaks to the distinction between movies that are direct-to-DVD or sold to television first vs major studio theatrical distribution. The idea of The Academy parsing these distinctions is counterintuitive, unless this effort is meant to penalize older and female members, for whom working options change. This likely starts the conversation with 1000-2000 current voting members with votes in jeopardy. Now add exceptions that lean toward inclusion, not exclusion. 1. You have been nominated for an Oscar. This is hard to argue against, even though there are many cases in which an Oscar nomination also represents the only work the person has done in film. Also, over these last few decades, not all nominees have been invited to join. Still, if this is held as the high bar, it is hard to argue for them elimination of rights for these members. 2. You have actively contributed time towards the health and vibrancy of The Academy. Simple, this. If you have volunteered and fulfilled your duties on any of the Academy boards, committees, screening programs, etc, for two years or more in the last decade, you are safe. Members of any age who have been active participants in The Academy after getting in should not be threatened. For instance, the group of members who have the time to volunteer to screen foreign-language films is famously heavy in seniors. Why? Because the time commitment is significant and hard to fulfill if you are employed full-time. But these people are not only engaged with a wider range of film than the average voting member, but they are giving back to the organization (above and beyond dues). It would be immoral to remove their voting status, especially while claiming that this is not an effort to socially engineer the organization. Some have brought up the idea that members who are not currently active in the industry be allowed to mentor others in order to earn their place. This is a great idea, but in order to make this viable, The Academy needs to have an official mentorship structure. It’s a great idea. But I don’t think it should be a “If you set up the rule this way, I will now volunteer and keep my status,” situation. If you have not participated in Academy committees in the last decade, I believe you should stay on the block for voting status change and if you have lost your vote and then volunteer for mentorship of committees for two years, you should then get your vote back. 3. You have at least five film credits, 15 television credits (shows or episodes), three Broadway or Off-Broadway (over 250 seats) show credits, or you have been nominated for an Emmy or a Tony since you joined the organization. The whole “three decades” idea is too clever by half. If the actual “three decades” standard is as short as 12 years, just cut to the chase. Did you have a productive, lengthy career after becoming a member? For many, the answer will be “no,” even if they remained active. Getting movies made is not easy. Nor a season of television. But keep the math simple. And I have included the theater in this Standard because the idea is to bring the best, most diverse group of artists to the organization and to keep them. Why penalize anyone for working in another medium at the highest level? 4. You have taught about film (not just a single guest lecture) at an accredited institution for at least three years in the last 15 years. Going from whatever work got you into The Academy to teaching the next generation about film is noble, invaluable work. Those who have chosen that path should not be penalized. 5. The duly elected Governors of your branch feel you are of value to the organization. This is the wild card. Maybe it’s an appeal from a member who is having their vote stripped, but I think it should all happen long before anyone is told they are having their rights removed. It shouldn’t be, except as a last resort, a member forced to plead for their position. That’s disrespectful. Just not right. My guess would be that under these guidelines, the group of Academy members with their voting rights threatened would be 500 or fewer. In other words, manageable by each branch. Does it really serve The Academy well to dump, say, Carl Gottlieb or Jules Feiffer from the voting rolls? Is that what Writers’ Branch Governor Phil Robinson wants? I don’t think so. Have you participated in Academy life since 2000 in a way that might nor be showing up in our records? Have you worked or worked toward the creation of a project since 2000? Have you taught in the arts since 2000? Have you contributed to the film industry in some other way since 2000? Is there anything else we should know about your work? Give them two weeks to return the request. Inform them that their voting rights will be suspended if they do not respond. On May 15, notify anyone whose voting rights have been determined to be appropriate to withdraw. Set up phone interviews for appeals on the week of May 22. Resolve any voting rights removals by June 1. Then, officially grandfather in all pre-2006 members for life and set the standard for the organization moving forward. Personally, I would suggest that being a member require 100 hours of service to The Academy in each decade of membership moving forward. As noted in Standard #2, these hours should include volunteering and fulfilled obligations to any Academy board, committee, screening programs, etc. Add mentoring programs. The goal should be to encourage community in the organization, not to create bars for members who have earned entrance into an exclusive organization to hop over to continually prove their value. And the organization should encourage the right kind of participation to make the film industry better – aka, lead – by the ways it builds out participatory opportunities. As I admitted earlier in this piece, there are biases inside The Academy and they will only evolve over time. The same is true about the mindset about The Exclusionary Rule. It is easy to hide behind political correctness. But the reality for many people is that they see an organization of old white men of privilege and are completely comfortable with making that group squirm as minorities and women have forever. Few will say it out loud, but that is the honest bottom line for a lot of younger people on this issue. To truly lead, The Academy has to do better than that. And I believe the organization can. I have some real issues with how the organization has been managed for the last few years. But I had different issues under the last regime. People and styles change. But I don’t think Dawn Hudson is uncaring. I think she, like Cheryl Boone Isaacs, are caught up in something that is very real and worthy and important, and lost some perspective on their existing constituency. The Academy should be focusing less attention on an award show and an overpriced museum and more on being the organization it wants to be… and that is not about being reactive to public fights… but instead about taking steps, when no one is demanding them, to lead 6000 very talented, thoughtful, sometimes crazy, film industry leaders to a higher level. Progress does not happen on a hastily put together Hollywood Reporter cover. That’s publicity, not progress. Put aside $5 million a year and hire a couple community organizers and with the human asset base of The Academy, not celebrity and and power, just raw talent, about great things can happen. Lead. If you are wondering about today’s title, think South Carolina. Trump is Deadpool… in so many ways, starting with the hair. And the runners-up both declared victory, however iffy the claim. The Mermaid is just the tenth film in box office history to gross $1 million on 35 screens or fewer. Two were Disney films (The Lion King and Pocahontas), one was The Blair Witch Project, and the other six were Oscar-push releases with full studio marketing campaigns that benefited the limited openings, while also building for an upcoming wide release (Precious, Milk. Black Swan, No Country For Old Men, The Descendants, Up In The Air). Admittedly, this is an oddball stat, but it shows you how powerful a draw this film is for Asian audiences in America and makes one wonder whether Sony is ever going to fix this seeming misstep. And if they are going to try to expand this film to a broader audience, they are really starting from scratch, having to ramp up a campaign that would normally take months to develop with almost no domestic publicity support. It’s a toughie. In the Best Picture race for Oscar, The Revenant is not only the only nominee in the Top 10, but it is the only nominee to be draw at least $1 million. 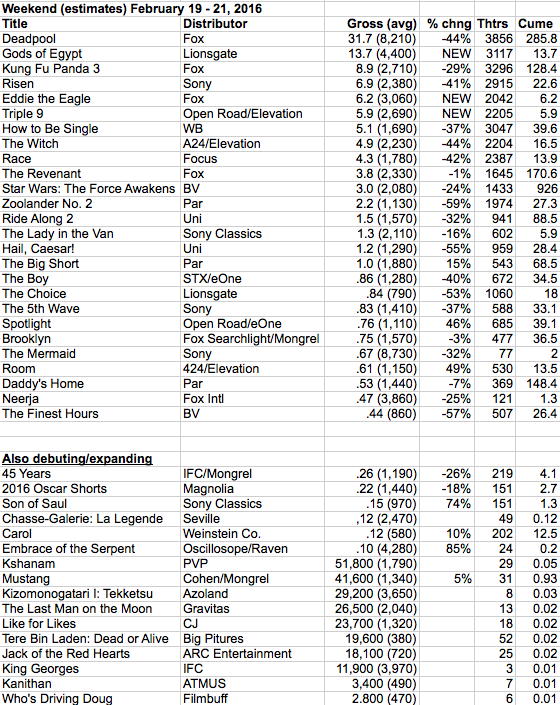 The Big Short, Brooklyn, Spotlight, and Room are still charting with $400-$900k grosses… but yuck. There have been between two and six Best Picture nominees grossing $1 million+ the weekend before The Oscars in the last five years. This year, just the one. Broadly speaking, the industry has pushed for two decades to frontload box office grosses so that now, a studio movie will make more than 80% of its domestic gross in the first 31 days. The Academy seeks to sustain audience interest in movies, the newest of which have been in theaters for 64 days. In the case of The Revenant, for instance, the January expansion made that only 51 days… but it’s still weeks longer than studios expect films to stay top of mind for audiences. 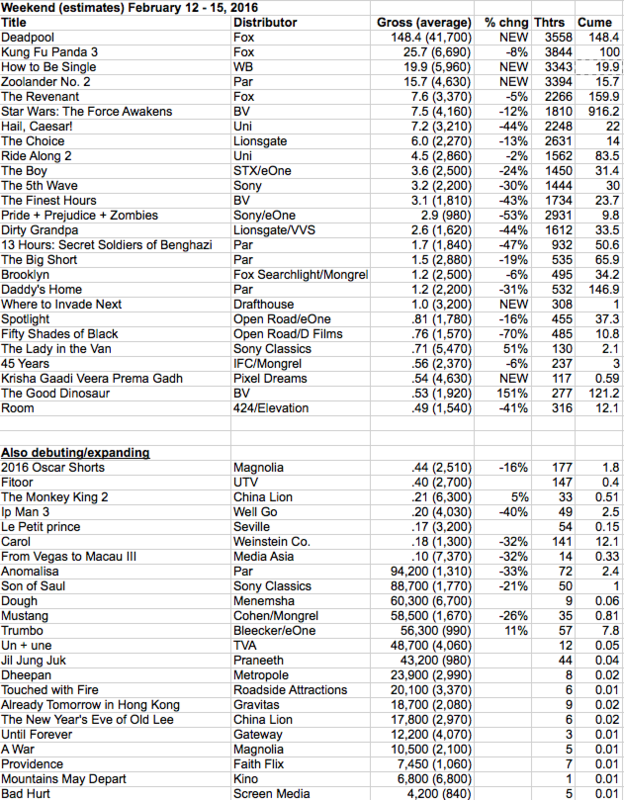 Also keep in mind that we who live in NY and LA still see marketing for the movies in play, whereas the odds of there being a single ad for any of these movies outside of the the three or four biggest markets in the last three weeks are almost zero. Three of the Best Foreign Language films are doing “good for foreign” business, with Hungary’s Son of Saul over $1 million, Turkey-France’s Mustang with a legit shot to get there (more so if it pulls off an Oscar upset) and Colombia’s Embrace of the Serpent opening strong with almost $10k per screen on 6. Working my way backwards, The Revenant is the only Best Picture or “Top 8″ nominee in the Top 10. By next weekend, although there may be a small Oscar weekend bump, there is every chance that none of the Best Picture movies will be in the Top 10. This has become the norm with the Academy Awards. Civilians complain that the awards talk is all about movies that they cannot see and Oscar theorists complain that there isn’t enough time to see everything before voting, but if you are wondering why The Oscars sometimes seem like they are a show chasing horses after the barn door’s been open too long, look to this. We live in a short memory world and Deadpool and The Witch are top-of-mind to American cinemagoers, not the Oscar movies. I’m sure I will write this in a post-Oscar column in 10 days, but if you want to make a change to the Oscar brand, start by digging deep into what the brand is and then make real change… which in my belief leads to a shorter season. Hollywood will adjust. Believe me. Oscar should have happened a month earlier, when the movies were still close to top of mind. The machinery of Oscar – and in this case, I mean the Academy’s show and process, not the media – has become the tail wagging the dog. Deadpool has a completely reasonable drop, influenced heavily (numerically) by the Thursday numbers which are included in Friday (stupidly) by rote. Look for the 3-day drop to be in the mid-50s. $200 million domestic is probably being passed by East coast afternoon shows as I type this. Top 10 domestic Comic Book Adaptation and $300 million domestic is pretty inevitable. The question is just how long it will go after BvS lands. Risen is doing solid Christian business. No idea what the ultimate number might be. 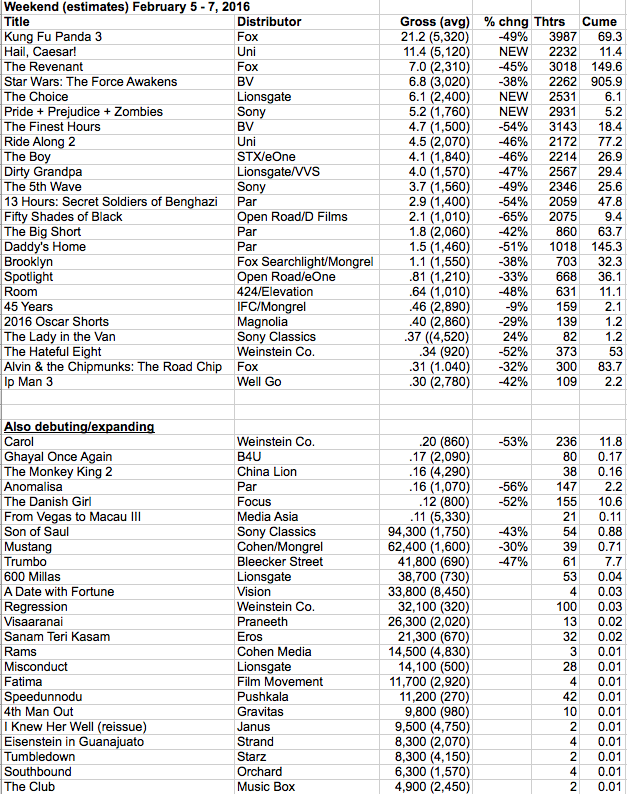 War Room opened to the same number and ended up with a sensational multiple, grossing $68 million domestic. The Witch gets film critics hot. And the Thursday night numbers looked Screen Gems-hot as well. But A24’s first wide release opening is looking more like an $8 million 3-day, which is great for A24, but not very Screen Gems-y. Still, this pickup is going to be very successful for the young distributor as they continue to build and stretch (and win their first Oscars next weekend). It has a very good chance of becoming the company’s biggest grosser ever (passing Ex Machina‘s $25.4 million). Everyone in the indie world would like to know exactly what the spend on this wide release was, in order to gauge the ongoing measure of limited release methods vs wide release. Speaking of limited releases, Sony is pushing out Stephen Chow’s massive Chinese hit The Mermaid almost reluctantly (to find a list of theaters, go here). And it did more than $10k per screen yesterday in spite of this. At least in Manhattan, it got a theater to go with its NYT rave review. In Los Angeles, there is nothing on the West side or in Hollywood, where we have 40 screens and a motivated audience. Race opened for Focus, but just barely. What looks like a $6.5 million 3-day is is line with films like Winter’s Tale, Seventh Son, and The Eagle in recent Februarys. STAT OF THE WEEK: Deadpool is the 17th opening in history of over $130 million. It is the third such opening in the last year that was not in the summer months or in the high-opening period in late November. 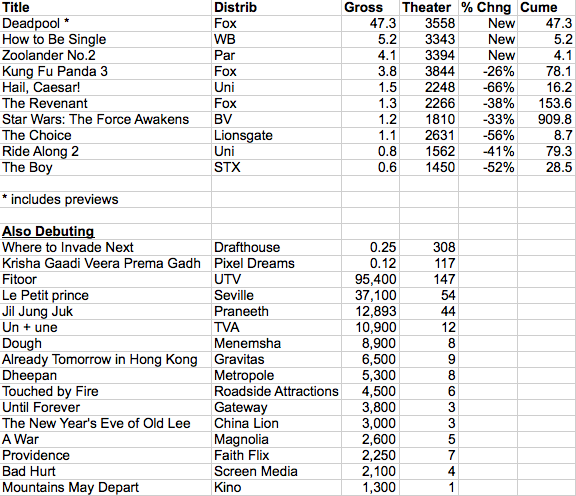 There were only two $130 million openings in summer/November in the last year. The first of this trio was Furious 7, in April, with $147m, which was a huge number, but also built a growing opening opportunity with the previous two F&F films and Captain America 2 in 2014. The next was Star Wars: The Force Awakens, whose overall numbers were not as surprising as the specific detail of its opening 3-day (inc Thursday) in December, which almost tripled the previous best opening in that month. The box office run for the film was much more front-loaded than the earlier big December openers, as the holiday has seen other films triple their openings by the end of the New Year’s holiday. Still, the idea of that kind of opening changed the game, including making it safe for Disney to place the next Star Wars trilogy film in December instead of summer. And now, Deadpool, with a $50 million improvement on the previous record (which was set just last year, 50 Shades of Grey). January, August, September, and October are now the only months of the year that do not have at least one $100 million opening that’s taken place. And one must assume that some distributor, facing a densely packed scheduled through the year, will put a movie with real megabuck potential in one of those months soon. Warner Bros has Suicide Squad scheduled for August, which has promise to have a $100m launch. Fox has Gambit in October, though that franchise may not quite be strong enough to crack that $100m ceiling… we’ll see when the ads start. 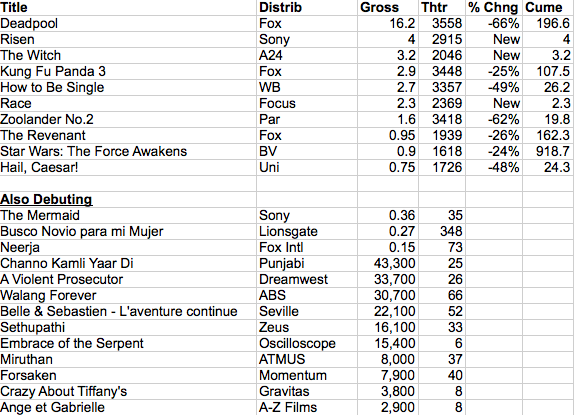 There were a record six $100m+ openings last year, smashing the record of four. This year, we look to have four or five by the end of May (Deadpool, Batman v Superman, Captain America: Civil War, X:Men Apocalypse, Alice In Wonderland 2). And I think Finding Dory, Ghostbusters, and Suicide Squad all have the chance to have $100m openings as well. Then in the fall, Fantastic Beasts and Where To Find Them and Rogue One. All these films won’t be mega-launches. And who knows what might surprise us? But it looks like we are well on our way to another new record for the number of mega-openings, albeit nothing close to Star Wars‘ feat in December. One can’t overstate how strong this Deadpool opening is. What the 3-day number is doesn’t much matter. It’s the best opening day number ever for January, February, and the first 3 weeks of March. It tops its obvious comp, Guardians of The Galaxy, by just under $10 million. 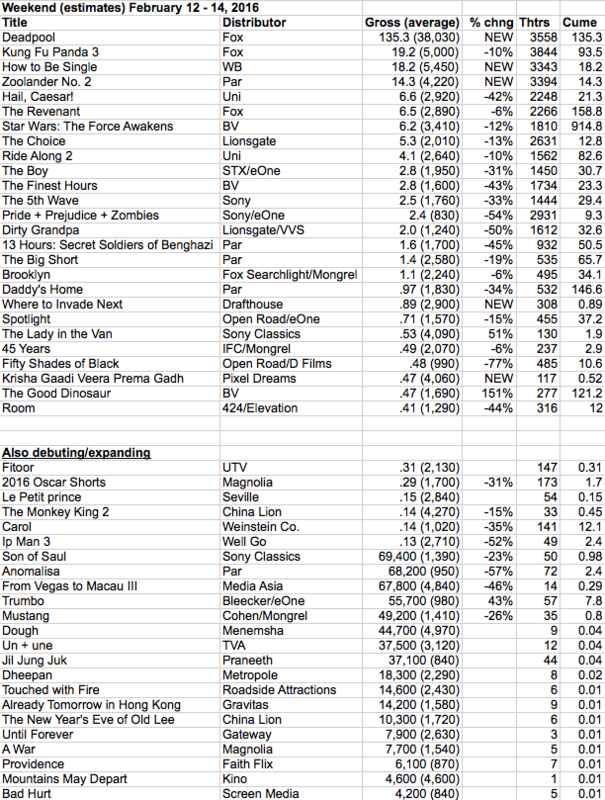 It’s more than a 50% improvement on the Fifty Shades of Grey opening day last year in this slot ($30.3 million). There have to be a bunch more records coming from Friday alone with a bunch of 3-day records sure to fall (even before they start making new ones up). The question about all of this is, “why?” And my take is that this is the beginning of the “end” of the comic book genre moving forward (until it makes a comeback a few years later with a “new” innovative genre take). This doesn’t mean that Batman vs Superman will tank… or Captain America: Civil War or X-Men: Apocalypse. But one of them could come up well short of expectations. Maybe more than one. It could be that the off brands, like Suicide Squad, Gambit or Dr. Strange become the kinds of films that audiences prefer for a while (though like all one-offs, there is even greater danger of out and out bombs). Add to this that we are at the age-out part of the cycle with the most powerful of the comic book franchises, Marvel’s Avengers. How many movies will the current crew make, how old will they get in the roles, and how big are the wheelbarrows of cash that can be offered before it gets prohibitive? I’m sure you have noticed that we are on our third Spider-Man in less than a decade. This is a problem inherent in superhero movies in general. A cliche. Origins, bigger suit, multiple suits… rinse, re-cast, repeat. What do you do with a superpowerful being over and over and over? How do you create vulnerability? Are the second tier characters going to able to become as popular as the first tier or will the economics start to become a bigger and bigger problem? We will have a pretty good sense of this as the next 2 years play out. There are 13/14 Marvel/DC Universe movies due in that period. There will be shake-ups. Of course, there is the other take on this… that Ryan Reynolds as Deadpool is, simply, the equivalent of Downey as Iron Man and that Marvel and Fox and everyone else can simply, cleanly built on/around the next Marvel superstar. We’ll see. Spider-Man turns up in Civil War, apparently. Someone will reboot Fantastic Four for a third time in a decade. The success of Deadpool is thrilling and scary and perhaps something right in between and only time will tell what it really means. How To Be Single… meh opening. And can’t really blame Deadpool. Comparing it to Fifty Shades, last year’s Valentine’s Day movie, is unfair. But it will also come up short of 2014’s Endless Love and About Last Night. And 2013’s Warm Bodies and Safe Haven. Or comedies Just Go With It and Valentine’s Day. Underwhelming. Sorry. Zoolander 2 needed a different date. Clearly, Paramount didn’t see Deadpool coming. And in this case, there is a real demo conflict. 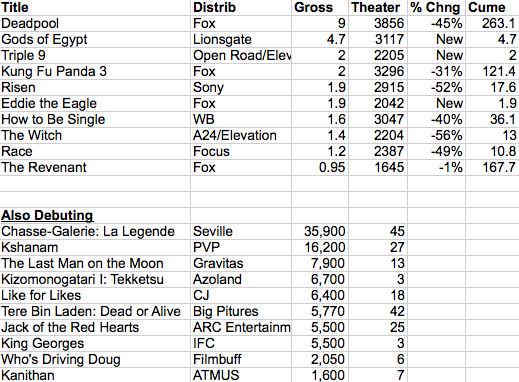 But even so, Zoolander 2 is what happens when Anchorman 2 does 50% more than the original (almost double worldwide). I have no idea what Zoolander 2‘s budget was and you have to hand it to the team, they have worked their asses off on promotion… but if this one does the same domestically as the first and doubles the international, they will likely get away unbloodied (except for the reviews). But the date and the competition definitely meant that no one would be wandering in to this one because that was at the multiplex and they felt like going to the movies this weekend. And that could have meant 25% more business. There is not much here to chew on. Only two films are estimated to do over $5350 per screen and those films are on just four screens each (and still not reaching $10k per). There are 5 Best Picture nominees still charting, but every one of them is in the downslope of their runs, on fewer screens than at their peak. The two December releases have done their best since being nominated and The Revenant will pass Mad Max: Fury Road at the domestic box office as the voting starts on Friday and may end up with a higher gross worldwide, but nothing exciting is happening on that front. 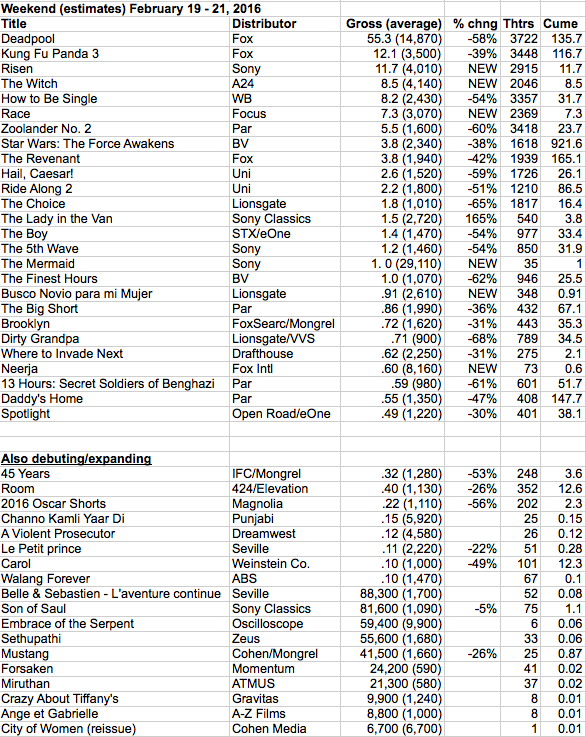 There would have to be a major upset for a Best Picture win to squeeze more than $15m – $20m out of any of these movies. Of course, that would make a big difference to Spotlight‘s bottom line… almost none to Revenant. The movie year so far has been soft, but not horrible. A lot of explaining why these movies have done okay… but not great. We’ve had 8 releases from the majors and their Dependents so far in 2016 and the results are consistently mediocre. The big indies have done the same… if not a little worse. The two leading films are sequels, both well off the franchise pace. This is not meant to diminish Star Wars‘ breathtaking success. It is meant to point out how the effort to front-load grosses has evolved at light speed. Like I said… looking around for something to eat at this table. Thin pickings. Happy Super Bowl! It’s Super Bowl Weekend and the 3-day numbers will be hurt… on Sunday. But that’s no excuse for a poor showing Friday or today. That said, what a Poo Show… or it’s a Po show, if you prefer. 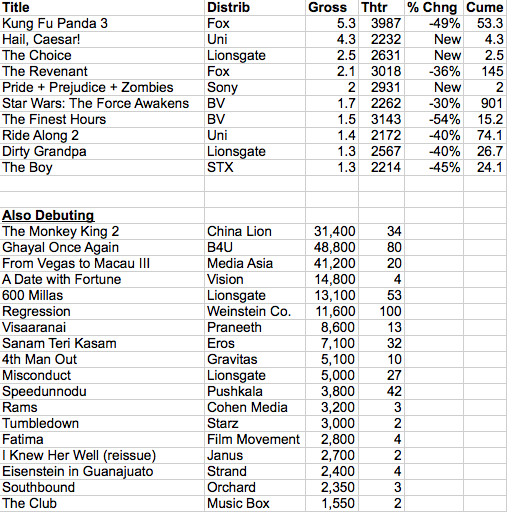 19% off the 2nd Friday of Panda 2 and 35% the total gross after 8 days. $105 – $115m domestic total. Mr. Peabody & Sherman numbers. You may remember how dramatic things got after that film didn’t fly. You may wonder why DreamWorks tried the January launch that is certainly helping to sink this franchise. Fourteen more animated movies from the major studios (inc Universal’s Focus division) this year. FOURTEEN. 2 in March. 1 in April (which was probably the most vulnerable slot). Angry Birds in May, Pixar sequel in June, 2 in July (Universal and Fox’s next Ice Age), 2 in August, 2 in September, 2 in November (inc DWA’s) and 1 in December. Hail, Caesar!, the 17th Coen Bros film, is just their 6th opening on over 1000 screens. And it should be noted that only two Coen film that grossed over $25m domestic was a platform release (O’ Brother & No Country). So, you can understand the angle that Universal is taking. That said, the opening, which will probably land between $10m and $11m, will be their worst opening on over 1500 screens, including The Ladykillers. The comp that seems to fit best is another Universal/Coens release with Clooney, Intolerably Cruelty, which did $35 million in October 2003. Pride & Prejudice & Zombies couldn’t overcome the general disinterest in seeing young women in petticoats kill zombies. If there is more to the movie, no one told potential audiences. Ten days ago, The Academy of Motion Picture Arts & Sciences offered a menu of measures with the avowed goal of accelerating diversity in the organization. We should applaud the effort. But one of the rules strikes me as more likely to be unfair to current membership than it to create a more diverse, unbiased organization. The plan to strip some members of their right to vote is loaded with unclear goals and genuine questions of basic fairness, regardless of whether people of color and women have suffered institutional bias from the Academy across the decades. If there is no intent to hold basic ideas of what is fair within this organization to bear, what is the point of this effort? Also, by attaching the removal of voting rights to the idea of equality, The Academy misguided the world. There is no mandatory cap to the size of Academy membership. If The Academy needs to strip votes from current lifetime members in order to get the numbers to seem more like “the real world”—even with an unlimited freedom to bring in more people of color and women by leadership fiat—then, as has been pointed out, there is an obvious industry problem greater than the number of members who are being expected to sacrifice their established rights, without complaint, for a higher good. Yes, you can say that any white male member who leaves pushes the percentage towards marginally greater diversity. But at what cost? From anecdotal historical evidence, few members are as out of touch as hype-sters would have you believe. But I am going to stop arguing about why this is so wrong. I have been looking for objective data since this began. Of course, The Academy likes secrecy. They could crunch numbers and make them public if they wanted to demonstrate a case in a constructive way. But they have chosen, even as they have made some good choices, to spin rather than respond to serious questions that these actions raise. I got my hands on a copy of the 2015 membership list of the Academy Writers Branch. So I started to crunch numbers, member by member, credit by credit. There will be some imperfections. I do not have a list of those members who have already made the choice to give up their vote in exchange for not paying dues. One membership count that I have seen was 392. My list is 429 deep (not including two branch members who passed away this last year). If you see something that looks wrong, I will be happy to research the issue and correct. It is also worth noting that vague elements of this new rule could make my analysis incorrect. For instance, what is “Active In The Film Industry?” Does development count? Do films that end up being released on TV or on DVD/streaming-only count? What is the cut off for 2006 work? If you work over 30 years, but the decade in the middle has no credits, does it count towards the “three-decade” rule? Someone threatened might suddenly get a project going, etc. I expect to run similar analysis of other branches in the weeks to come. Please feel free to contribute your branch’s membership list to the effort if you are interested. I would never ask this of anyone under any other circumstance. I don’t believe that media outlets should have these lists… because they will used almost exclusively to solicit members for no purpose other than generating revenues. Not my interest. I just want to be able to produce objective analysis. Again… The Academy could crunch these numbers a lot faster and with greater complexity than me, doing in days what will take me weeks or months. But have you heard any supporting stats from The Academy on this? No. Why? You tell me. I am not going to call out the “safe” members who I think are suspect. One, for instance, was invited into The Academy 6 years after their last produced film credit. I assume this was under 2020. I am not here to tear down 2020. But when 2020 is attached to the removal of other members, it becomes something less hopeful and celebratory. It becomes part of an exclusionary process. The Writers branch membership broke cleanly into four groupings, as laid out by The Academy in its explanation of the new rule. 105 members have been nominated for, or won Oscars, and are either working now or have had credits in the most recent decade. These are the unassailable members. 124 members have been nominated or won, but have not worked on produced films in the last 10 years. 116 members are working or have worked in the industry in the last 10 years, but have never been nominated. The last group of 82 are the ones under threat from this new rule. 26 of these members fit under what The Academy has defined as an exception to the rule of working currently. These members have credits in three separate decades, but have not been credited for produced films in over a decade. These members are no longer under threat. Two members’ histories are too unclear to make a call about what category to place them are in. I don’t have the needed details. This leaves 54 members under threat of losing the vote. Some of these members may, I should remind, be saved by projects that didn’t get made, but were legitimately in process in other decades. It is impossible to say what The Academy will hold as their standard. (Rumors are that there is already a plan a foot to investigate every never-nominated member for a more subjective set of qualifications… but this is a rumor. The idea of The Academy investigating members is well past scary and inappropriate.) They could also appeal to their branch leadership and keep their vote that way. There are very few cases of members who have gotten in by what seems to be a reach. The Academy is a country club of industry success. It always has been. And it always will be. That, like it or not, is it’s power… and why so many want to feel included as part of this particular group. That crony is Jane-Howard Hammerstein (aka Mrs. Oscar Hammerstein III, daughter-in-law of Oscar II, aka the one you know). She’s no slouch. But her accomplishments (including an Emmy nomination) were in television. There does seem to be a history of couples joining The Academy together, even if one was not accomplished in film. But most of those who came in this way are long gone. Not a shabby list, eh? 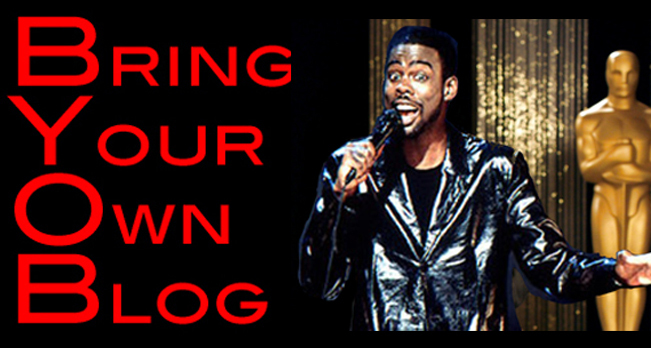 You want comedy greats? You got Jerry Zucker, Carl Gottleib, Jules Feiffer, Eric Idle, Michael Palin and Michael Elias, amongst others. Disney folks? Noni White, Bob Tzudiker, Andrw Marlowe and Malcolm Marmorstein. You want playwrights? Lyle Kessler, Terrence McNally, Ron Clark, David Rabe. Career-makers or Oscar launchers? Danilo Bach (Beverly Hills Cop), Hal Barwood (Sugarland Express), David Freeman (Street Smart), Stanley Weiser (Wall Street), and Raphael Yglesias (Fearless). A survivor of the blacklist? Jean Rouverol Butler and her husband, was also a screenwriter, who had to flee to Mexico and used fronts to work. Three members in this group made their last movie in the 1960s. There are five who have no credits beyond the 1970s. Fifteen in the 1980s. That’s not half the group. Movies made in the 90s? It’s not recent, but they can feel current. Time is not always the best measure of cultural significance, whether we’re looking at The Lion King or Jaws, Dirty Dancing or many of the other titles listed above. Will it really make anyone feel better to be rid of the woman who wrote Gidget or the guy who wrote a bunch of Elvis movies or the team that wrote a lot of TV and a couple of movies, but somehow got into The Academy, or the woman who just won her third Emmy for “Olive Kitteridge”? It’s a conversation. But the majority of writers in the Gang of 54 have penned movies that I have happily watched multiple times. They may not be the Clever New Kids, but they aren’t deadbeats, hanging on to the one last thing of value in their lives. Most have done great work. A few are legends.